I’m sitting here in the lobby of the Flamingo Resort in Santa Rosa, at the 2nd annual Wine Tourism Conference, in Santa Rosa, with fond memories of the Wine Bloggers Conferences of 2008 and 2009. The buzz is certainly different, with industry reps. tour operators, writers, and print media outlets, but the buss is here. Spending a brief morning at the trade show, I saw many faces I knew, but I also saw many faces I didn’t. Up and coming wine regions that you would not think of were represented, and I was looking forward to learning more about them. All sorts of industry professionals were represented, including tour operators, wineries, tourism associations, PR firms, and of course – those pesky bloggers! I was looking forward to both getting to know these great group of people ,but also learning what the challenges in the industry are, and how we, as new media representatives can help. Of particular interest to me were the challenges that individual regions have attracting visitors to their wine destinations. Both on a personal and semi professional level, the topic fascinates me. Additionally, the age old question of how ot engage with social media and how to utilize new media. I am a social media freak, and if you have known me since the first Wine Bloggers Conference, you know that I am also a twitterholic. While some of this has waned in recent years due to professional and personal obligations, it is still a fiery passion. In addition to my social meida addiction, I am passionate about finding out how I can help bring the wine business in to the 21st century uses the tgools of the trade. These tools include CRM but also include business practices and methodologies that are universal across businesses. So, where can wine take you? 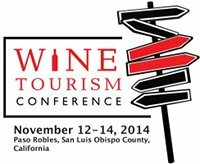 Stay tuned this week and I give you some of my insights, ideas, eye opening moments, and observations from the Wine Tourism Conference.